Nelson's Point of View: Help Feisty Princess Charmaine fight cancer! If you're thinking of splurging on something to make yourself feel good this Christmas, stop. There're other ways of feeling good, such as helping others in need. I came across this blog while surfing, and I was floored to know that there's someone in need of our assistance. Charmaine is only four, and she has been diagnosed with a rare form of cancer. Treatment is possible but costly, running at US$350k. It's good to pamper yourself from time to time, but before you splurge on the handbag, dress or gadget that you might buy and use for only a couple of times, consider using a portion of that fund to help someone else instead. The treatment is costly and Charmaine's single mum cannot raise the funds alone. Harness the power of the internet and help them raise the funds - it only takes a little effort each to do so. Please spread the word! I've thought over it carefully. 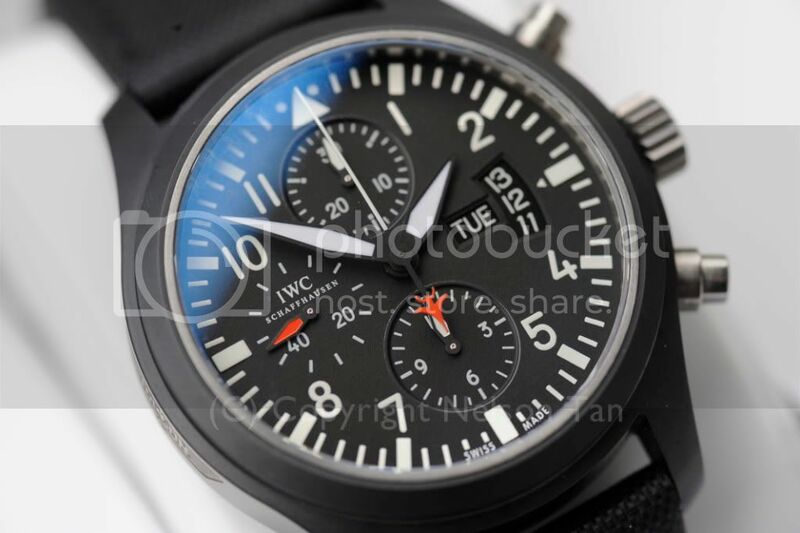 So here's the deal - I've a IWC Top Gun chrono for sale (brand new in box). It's a collector's item since it's been discontinued. Buy it from me and the entire proceeds ($8800) will go to Charmaine's donation for medical bills. Yes, you read correctly... the entire sum! So if you're looking for a nice watch to buy, this is it. You'd definitely feel much better wearing it knowing that you've helped a little girl fight cancer. You can write the cheque directly to the account number listed on the blog, so the money can go direct to her. Mint condition with everything as per AD would supply. Warranty card dated 27th October 2008. A fellow watch lover Andy at the Singapore Horological Club has kindly agreed to donate a fine bottle of The Glenlivet 18yrs old single malt whisky to the kind soul who purchases the IWC ceramic Top Gun watch! The Glenlivet 18yr single malt scotch received a double-gold medal at the 2009 San Francisco World Spirits Competition, so it's really top grade stuff! Thanks Andy! The IWC Top Gun chronograph watch has been sold to James Ng, who was only too happy to be able to help someone in need. As I mentioned to him, there's no better way to enjoy his watch than knowing that he has bought someone else time to live on! This is also a great chance to thank my dear friends Khim, Sean and Cindy, who donated more money to this cause. I'm sure this Christmas will be a great one for all of us, knowing that we've done our part for someone in need. More importantly, we hope that it'll be a season of joy for Charmaine and her family as well! So comes the good news... we've consolidated a total of SGD10,000 for Charmaine! Yes... I know it's still a drop in the ocean considering the amount that she needs, but it's a step in the right direction. So watch this space... I'll be contacting Charmaine's family to pass them the donation. Thank you for your generosity. May God watch over you and bless you bountifully and successes in all your endeavors. very good. It'll all come back to you in time. I hope you can raise it just in time. By the way i love the watch featured here.